All the printed paper is from the Summer Smooches Designer Series Paper pack, and the Daffodil Delight Seam Binding Ribbon is from the Summer Smooches promotion also. I love how the green colored paper has lines on it--I just snipped right down those lines, then cut the tops at angles, and scrunched, to make the "grass" on the card! See those little tiny flowers at the top left and bottom right of the greeting? They are punched out of another piece of Summer Smooches DSP, using the little 4-petal flower from the Itty Bitty Punch Pack. 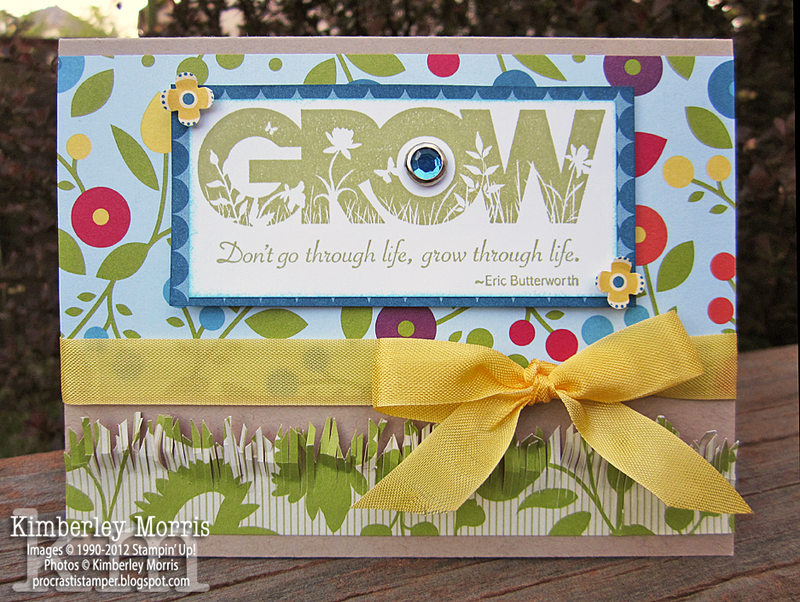 The flower punch fits perfectly over each of the little circles on that patterned piece of paper, for the perfect accent. The greeting itself is actually a stamp available only to demonstrators to purchase. I got it at Convention last summer. Don't you wish you were a demonstrator, too? Guess what...Stampin' Up! has just come up with a NEW $99 Starter Kit, where you order ANY product you want, up to a retail value of $125. Stay tuned, I'll give you full details tomorrow. RETIRING ACCESSORIES LISTS RELEASED TODAY! Today, April 25, 2012, the list of Retiring Accessories was released. These items will only be available ONLY WHILE SUPPLIES LAST, or no later than May 31, 2012. Click Image to Shop Retiring Products NOW! UPDATE: Craft Scissors and Paper Snips were listed on the original Retiring Lists by mistake--they will be remaining. My files have been updated. You will see many ink pads and lot of card stock on the retiring list...let me explain a little about what's going on. Some of it is being "repackaged" or "redesigned". First, 12x12 TEXTURED CARD STOCK WILL NO LONGER BE OFFERED. If you want 12x12 Textured Card Stock in Stampin' Up! colors, please ORDER NOW while the colors you want are still available. The 12x12 Smooth Card Stock will still be offered, but only in select individual colors and collections (which I will not be able to list for you until May 8th at the earliest). Also, SIMPLY ADORNED and DEFINITELY DECORATIVE PRODUCTS WILL NO LONGER BE OFFERED. If you want any of these products, I once again urge you to ORDER IMMEDIATELY for the best selection. In addition, you will notice that ALL our ink pads are on the Retiring List. Here is some clarification on that: CRAFT INK PADS, CRAFT INK SPOTS, AND CRAFT INK REFILLS WILL NO LONGER BE OFFERED...with the exception of BLACK and WHITE Craft Ink Pads and Refills. And one more bit of information, INDIVIDUAL STAMPIN' WRITE MARKERS WILL BE OFFERED ONLY IN SELECT COLORS...though they will still be available in color collections packages (i.e., Neutrals, Regals, Brights, Subtles, In Colors). If you have any questions on these retiring products, please feel free to EMAIL ME or call me at 719-205-5957. It is IMPERATIVE that you ACT IMMEDIATELY to ORDER YOUR RETIRING ACCESSORIES NOW before they are SOLD OUT! RETIRING STAMPS LISTS RELEASED TODAY! Click HERE for the PDF color flyer! During the Summer Smooches promotion, Stampin' Up! is offering the opportunity to purchase a suite of brand-new products from the 2012-2013 catalog, including two Limited Edition products that are only available April 1-30. The items are listed below for your convenience, the Limited Edition products are marked with an asterisk. Click the image above to SHOP SUMMER SMOOCHES NOW! 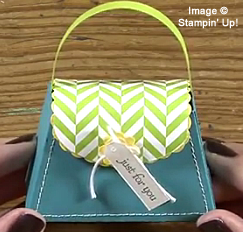 My favorite is the Petite Purse Bigz XL Die...you can see how adorable it is in the picture below--the sample was made using the Summer Smooches Designer Series Paper, and coordinating card stock. The coordinating colors are: Daffodil Delight, Real Red, Tempting Turquoise, Lucky Limeade, Island Indigo, Tangerine Tango, and Rich Razzleberry. Can't you just see these adorable purses as table favors at your Mother's Day luncheon? How about making them to give out at coffee with your gal pals? And, wouldn't your girly-girl graduate just coo over a gift of jewelry in this petite purse?? You don't even have to put gifts or treats in the purses, think of the fun you could have putting a basket of these out on a table, with fortunes or fun quotes in them! Remember, the Petite Purse Bigz XL Die will not be available again for purchase until June 1st, so BUY IT NOW to use for Mother's Day and your graduation celebrations.